I went home this past weekend to visit my family and run a local 10k, the Groton Road Race. It’s put on by the running club that my mom and I first joined when we decided to train for our first half marathon. I was away at college at the time and my mom wanted to find some people to run with while I was gone. I remember feeling slightly intimidated by everyone in the club who seemed so much more advanced in their running, but of course, everyone turned out to be SUPER nice and welcoming. And here we are 5 years later and I’m no longer training for my first half marathon but my 18th!! The plan for the 10k was to include it as part of a longer run and workout. 4 miles beforehand, followed by the 10k (splits I was aiming for were 2 miles at 8 min pace, 2 at 7:45 and finishing 2 at 7:30). Then 2 miles cool-down for a total of 12 for the day. 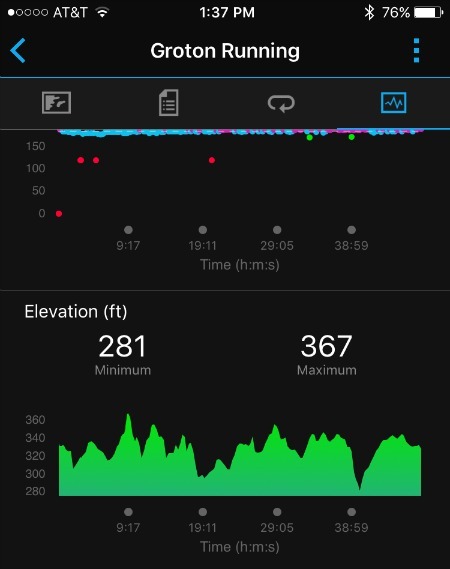 I knew the course had some rolling hills, which so does the Fast Half, so I was excited to see how I’d handle running those paces with some challenging elevation. The race didn’t start until 11:50 (SO LATE!!) so I was able to sleep in, have a leisurely breakfast, and head off to run my 4 miles with plenty of time to spare. I did it on a rail trail near the start of the 10k. I haven’t run on a rail trail in a while and I forgot how much I enjoy them! There’s nothing like a flat, paved trail through shady woods for running some comfortable, easy miles. 🙂 The first 4 miles weren’t very interesting, apart from the fact that I kept catching myself running a little too fast as I got excited thinking about the 10k to come. I knew that was a good sign and I felt ready to push. I finished my 4 miles with some time to spare before the start of the 10k so I was able to rehydrate (I used nuun performance mix with water which was yummy and seemed to work really well). The race was bustling since they offer a tots trot, 2k fun run, 5k and 10k. There were 2 food trucks (Jamaican food and cupcakes which I was totally eyeing). Finally, it was time to line up! Right on time, we were off. The race started on the track at the local middle school before running off onto the roads. It was fun and I was definitely excited because I found myself running a 7:17 pace through the first quarter mile or so… Whoops. I made myself slow down, knowing there would be plenty of time to push the pace later on. I hit mile 1 in 8:03, so mission accomplished. As we went into Mile 2, there was a nice series of ups and downs. While I always talk about hating running hills, I think I kind of forgot how much fun it is to run fast downhill. I tried to think about the talk I had heard Ryan Hall give about running Boston and how you shouldn’t lean back when running downhill because it’s basically like using your quads as brakes and will really beat you up in the long term. Obviously, this wasn’t a marathon but I knew I still had plenty of hills ahead of me and I wanted to save my legs as much as possible. I hit Mile 2 in 7:57. I knew things were going to get interesting in Mile 3. I felt like I had been running pretty comfortably aiming for 8 minute pace during the first 2 miles and I knew that I was going to have to start pushing. Early into this mile I took a GU to practice fueling at a faster pace since this was something I struggled with at the Half at the Hamptons. I was able to get it down without incident. I felt like I held pretty close to the 7:45 mark throughout this mile, except for when I grabbed water at the first water station. I didn’t stop running, but I think I slowed a little and lost a few seconds. Mile 3 was a 7:50. I think maybe the water was just what I needed or I was finally hitting my stride at this pace though because I felt STRONG through the next mile. The hills continued to be hard, but I never found myself mentally beating myself up on them. Every time I started to think about slowing down, I remembered back to the post I just wrote on mental toughness and how I had promised to fight during the Fast Half. In my mind, this 10k had become a dress rehearsal for that race and I did not want to let myself down. I hit Mile 4 in 7:39. With 2 miles to go, I knew things were going to get tough, but this was the exciting part. After watching so many people cruise by me in the first 2 miles, I was finally catching up to and passing runners. Right around this time I caught up to a runner from our club who was running right around 7:30 pace with another older gentleman. I set my sights on them and focused on just sticking with them. There was an awesome downhill section here and I really just let my stride open up. Mile 5 was 7:31. I knew the last mile was going to be a grind. In talking with some club members who had run the 10k in years past, I knew this was one of the worst of the hills and it was indeed a doozy. But I still felt strong. I was so proud of the splits I had been hitting up till this point and I didn’t want the last mile to ruin it (perks of being a perfectionist I guess…) Just at the start of Mile 5 the course rejoined with the end of the 5k runners who were taking a more leisurely pace. Luckily, I tucked in behind my runner club friend who was very vocal and good at clearing a path for us so I didn’t have to slow down too much. Mile 6 was 7:37. Not exactly perfect, but still my second fastest split of the race. I ran the last .2 at a 6:56 pace to finish in 48:16, an average pace of 7:44/mile. My watch informed me this was a new 10k PR! I also found out later I got 4th in my age group. Not too shabby for a workout! I happily guzzled a water, ate a couple of orange slices and a homemade cookie while I chatted with a few friends from the club who had run the 5k. After I had caught my breath and hydrated a bit more, I headed out for 2 cool-down miles. Overall, I loved this race. I had volunteered at it in the past, but never run it and I was actually surprised with how much I loved the course and with how many spectators there were. I felt like this was great test for the Fast Half coming up, and I think I passed. I never gave up on the hills and I felt strong running 7:30-7:45 pace. With the taper coming up fast, this was just the confidence boost I needed. This entry was posted in Uncategorized and tagged Fast Half Marathon, Groton Road Race, Half Marathon Training. Bookmark the permalink.